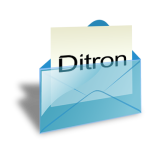 we inform You that due to a malfunction in the telephone lines Ditron switchboard and e-mail today are not operational. As soon as the system will be restored You will be informed. To unsubscribe click here. To edit your profile click here.